Reelcraft's Series CEA and WC are designed to increase work area safety and help increase efficiency and productivity. Reelcraft Welding cable reels store work lead or electrode lead, up to #2/0, safely and effectively when not in use. They have a continuous current path through a live 400 AMP, 90VDC (maximum) rated enclosed slip ring. Welding cable is not included on all Series CEA and WC models. Safe-T-Reels are ideal for applications where space, weight and flexibility are key. These Reelcraft welding cable reels are designed for manual winding of welding cables. Reelcraft Safe-T-Reels offer trouble-free management of large capacities of cable. Suitable for outdoor use. You may select configurations to suit your specific needs. Reelcraft Safe-T-Reels are ideal for applications where space, weight and flexibility are key. These reels are designed for manual winding of welding cables. Versatile in function, select configurations to suit specific needs. Safe-T-Reels offer trouble-free management of large capacities of cable. Suitable for outdoor use. Acetylene and fuel gas (red) inlet 1/4" FPT / oxygen (green) inlet 1/4"FPT.TW84000 and TW86000 have B size 9/16" - 18 UNF male welding inlets. T grade hose reels are used for a wide variety of gases such as mapp gas, propane gas, natural gas and fuel gases. 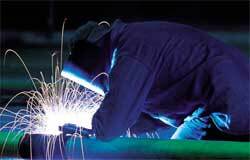 When ordering any welding hose reels you must specify the type of gas being used.